Dan Hester, the founder of Meow Now and animal activist, is leaving the organization he founded because of health issues. He said he plans to focus on ways to eliminate animal cruelty. 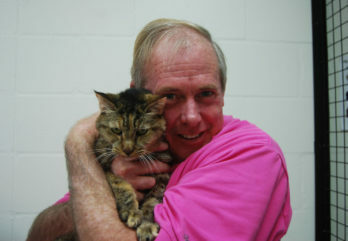 SEMINOLE – Dan Hester, longtime animal welfare activist, is stepping down from Meow Now, the organization he founded. Hester said he planned to retire from Meow Now at the end of this year but moved the date up to give him time to recover from a detached retina. Once recovered, Hester said he plans to continue working for animal welfare by focusing on the way animal cruelty and neglect are handled in Pinellas County. Hester is a former member of the Seminole City Council who has long had a soft spot in his heart for animals. He spearheaded the movement that brought an anti-tethering ordinance to Pinellas County. Then he moved on to the problems surrounding the overpopulation of community, or feral, cats. Animal advocates had long urged Pinellas County to adopt a program of trap-neuter-vaccinate-return as a way of eventually eliminating the county’s community cat population. But county officials remained opposed to TNVR as a solution to the problem. They instead focused on capturing the cats and euthanizing them. Hester spent much time and his own money in lobbying county commissioners and putting together a business plan and a coalition of animal advocates that included SPCA Tampa Bay and the Humane Society of Pinellas. In 2014, he founded Meow Now to provide TNVR for free-roaming cats as well as support and education to colony caregivers. He was successful in convincing the county commission to permit Meow Now to do a two-year trial TNVR program. Two years’ later, the county continued the program and has endorsed TNVR as a best practice to manage and end the overpopulation of community cats. Meow Now has TNVR’d more than 4,000 community cats since 2015. Hester said that number will likely reach 5,000 by the end of this year. Meow Now said that Hester’s work extended to more than lobbying, creating business plans and serving as president and on the Meow Now board. Photos of Dan Hester courtesy of Meow Now.